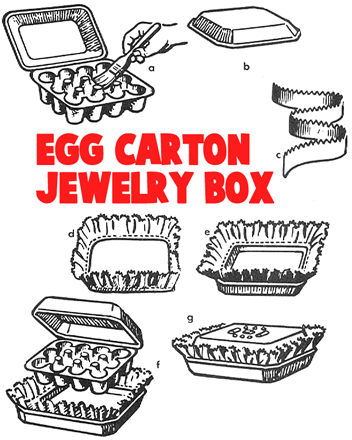 Egg cartons are pretty useful items, as far as packaging goes. Without egg cartons, my eggs would just be floating all over the refrigerator. Eggs are pretty roll-ish foods and the break quite easy, so I am quite happy about my eggs coming in a carton. Eggs sometimes come in cardboard-like cartons and other times they come in styrofoam-like cartons. I like the cardboard cartons better as they are better for crafts because they are sturdier and they hold paint and markers better. There are so many crafts that you can make with egg cartons, such as people and animal figures, cabinets, flowers, caterpillars, and so many other types of crafts. Find some entertaining ideas below. Take an empty egg carton and cut it in half or use the size required for a half-dozen eggs. Cut off two thirds of the cover so there will be four compartments exposed. Paint the outside of the carton with poster paints. It is a little difficult to cover up the heavy bands of color on some egg cartons, so use a dark color. Several coats may be needed. Paint the inside of the exposed compartments a contrasting color, Let this dry and then decorate at the bottom with little scrolls or simple flowers. Figure 15 Now the cabinet is all ready to use. If the children collect miniatures or figurines, this is a good place to display some of them. It will take four tiny figures nicely—one in each exposed space. Or cut little figures out of a magazine, allowing enough paper at the bottom to form a tab that can be folded back and pasted down to hold the figures in place. See the picture above. A cabinet like this makes a nice piece of dollhouse furniture—if it is a large dollhouse. A whatnot cabinet can also be made from the full-size carton. Cut the cover exactly in half so the bottom half will look like a cupboard and the top half will provide six inches. This is a really fun crafts project to work on. First of all cut out the flower from paper...if you want to make tulips like the one you see above....just make an oval shape with 2 upside down triangles cut out from the top of it. Colorize the popsicle sticks by painting them or just coloring them in with markers. Now glue the flower to the top of the green popsicle stick stems. Then get the egg cartons and separate the top from the bottom. Use the bottom of the egg cartons to hold the flowers....you can paint them a beautiful color so that you can't tell that it is an egg carton. Put brown play dough inside the bottos of the egg carton holes to represent dirt....you can glue them in there if you want to. Then let everything dry...and you got yourself a paper flower garden. To make egg carton worms, you will need One molded paper egg carton, scissors, green and orange poster paint, brush, (optionally) 2 notebook paper 'reinforcements, and 1 orange pipe cleaner. Firstly, cut the bottom part of the egg carton in half lengthwise leaving 4 or 6 egg cups on a row. Turn the cups over so the open side is down. This gives the worm a humpy look. Insert the pipe cleaner through the top corners of the first cup to make the antennas. Starting with the antennas, paint an orange streak down the back of the worm. Paint the rest of it green. Either paste googly eyes, paint eyes, or paste the 2 notebook paper reinforcements below the antennas for eyes. If you wish, paint the center of the eyes orange and draw a black circle in the center. You will need the following : Cup-type egg cartons (sketch a), assorted colors of pipe cleaners, candy and baking cups, vegetable coloring or paint, brush, scissors, large safety pin, and ribbon or small blocks of styrofoam. 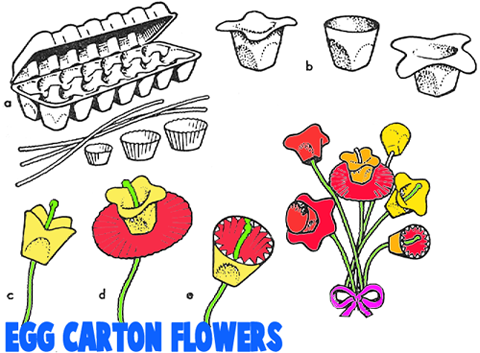 There are various ways to make these flowers because there are many kinds of flowers to make. Several types of flowers are shown here. 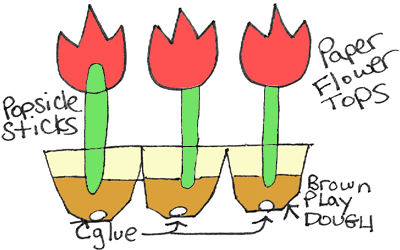 Cut the egg cups apart and trim edges evenly according to contour desired for flower (this will vary). (See sketch b.) Make a hole in the bottom of the cup with a safety pin, then color the cups with paint made from vegetable coloring (or you can use real paint). When dry, choose the color of pipe cleaner desired for stem and double one end to form a knot which will keep the flower from slipping off. If a long stamen is desired for the flower, make the knot about 1" from the end of the pipe cleaner. This procedure should be followed for the more simple flowers. To make a jonquil, attach a paper baking cup, flattened out, to the bottom of the egg cup. (See sketch d.) To make a primrose, nest a colored candy cup inside a cut-down egg cup and attach with the stem (sketch e). Tie a cluster of flowers together with a ribbon or place in flower holder. Get a large egg carton and paint the egg carton with some paint mixed in with a bit of white glue. This will help it stick to the waxy surface. Let dry. Trim some cloth with pinking shears (c) and glu earound the insideedge of a tin pan. Then place the egg carton inside the tin pan (f). Decorate the top of the egg carton lid with shells, imitation jewels, beads, string, macaroni noodles, or whatever you think will look nice. The egg carton works nice for separating your jewelry. Egg Carton Tulips That Mom Will Love - These turn out beautiful and are easy to make. Find out how. Candy Filled Baby Chick Using Egg Carton - Using an Egg Carton, make these candy filled baby chicks. Egg Carton Pom Pom Caterpillars - These colorful caterpillars will cheer up everyone that seem them. They turn out so cute.